My son William does not believe in mnemonics, much in the same way that my wife does not believe in stoplights. They might be useful for other people, but mostly they are hindrances to be ignored. Although I am more of a believer in mnemonics, I do have a better appreciation of Will’s point of view now that I have been in the Ozarks. It started a couple of weeks ago when I was following a mother and child down into Missouri’s Onondaga Cave. “Let me teach you something,” the mother began. “We’re going to see these really cool formations called stalactites that hang down from the top of the cave. You can remember the word for them because it has the letter T which looks like a stalactite with its long tail hanging down. 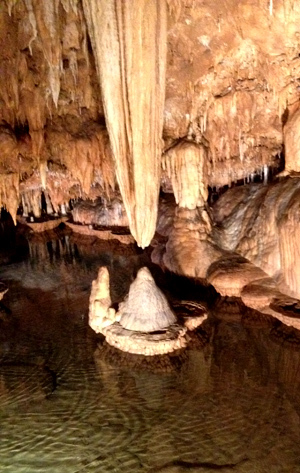 And we’re also going to see formations that are like stalactites rising up from the floor. You can remember the word for them because it has the letter M which looks like two peaks sticking up. These are called stalacmites“ (sic). And I thought: You ignorant woman, you have a bad mnemonic. Stalactites have a C for ceiling. Stalagmites have a G for ground. We were descending into a world of spectacular, eerie beauty. But now I was thinking mostly about how Plato was wrong about the Cave. And how appropriate it is that the spelling of mnemonic is so difficult to remember.